Authors: Joyce and Ferde Grofé, Jr. Plot synopsis: A man who despises humanity wishes he could be entirely alone, but when he steps through a door and finds himself in a completely deserted Manhattan, he begins to question whether this is really what he wants. Review: This episode has a very strong feel of The Twilight Zone about it, and even comes complete with a Rod Serling-style narration (though it predates The Twilight Zone by a couple of years). In particular, it is highly reminiscent of the very first episode of The Twilight Zone broadcast, 'Where Is Everybody? ', which similarly features a character wandering around apparently deserted streets, with no idea why he is the only inhabitant. 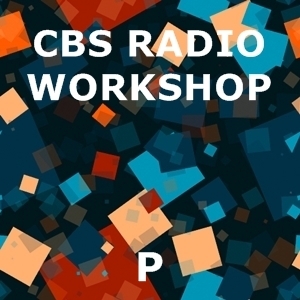 As ever with the CBS Radio Workshop, the production is impressive, with well-orchestrated music and sound effects. However, the story is only partially successful. A full half of the running time is essentially prelude, establishing the protagonist's credentials as a grumpy misanthrope. Only then does the plot proper kick in, with the main character mysteriously transported to an inexplicably uninhabited Manhattan. This part of the story is much stronger, creating a spare, disturbing atmosphere. Yet even so, the problem is that there isn't much of a payoff to the tale, with no final twist, or any real explanation as to what is going on (which makes it very different to The Twilight Zone episode noted above). Leaving some questions unanswered is often very effective in fiction, but here it just feels like the writers couldn't come up with a decent ending. Plot synopsis: A sound portrait of London. Review: As a Londoner, I had a particular interest in listening to this episode, to discover what the city was like over half a century ago. What is most surprising, perhaps, is how little seems to have changed - at least on the surface. The episode offers what is essentially a tourist's guide to the city (it was, after all, aimed at an American audience), and as such ticks off the expected list of visitor attractions: Buckingham Palace, Big Ben, London Zoo etc. This would be a very similar list today, which is why it may feel as if not much has altered over the subsequent sixty years or so (give or take a few additions, like the London Eye). Much of this remains very interesting - such as the origins of Big Ben's name - even for a modern visitor. However, what may be less obvious are the changes that have occurred to the people of London. For starters, in the 1950s, when the episode was broadcast, the class divide was still very explicit. The tour of the city is presented by Sarah Churchill, daughter of Prime Minister Winston Churchill, and her cut-glass upper-class accent contrasts strikingly with the accents of her working-class interviewees, in a way which would probably be less obvious now: someone of Churchill's social status would likely tone down her accent for radio or television today; she might even attempt to adopt a more 'street' one. The other notable difference is that everyone featured is obviously white. Until the 1950s, Britain was a very predominantly white nation, but in this decade it was just beginning to undergo a major transformation thanks to mass immigration from its one-time colonies (India, Pakistan, Kenya, the Caribbean etc.) that would continue throughout the post-war period. Consequently, any depiction of twenty-first century London would be bound to take into account its contemporary multi-ethnic character. All this aside, Churchill makes for an entertaining guide to Britain's capital. Not just a former Prime Minister's daughter, she was also an actress, so is at ease presenting to an audience. Plus, she demonstrates a genuine interest in the people and places she encounters, making this a worthwhile listen even many decades later. Plot synopsis: A sound portrait of Paris. Review: Not being as familiar with Paris as I am with London, I had less basis for judging this episode's success in capturing the spirit of the city than with the episode 'Portrait of London' (see above). In any case, unlike the London episode, this one is much less about the physical city - its famous buildings, landmarks etc. - and more about the people and their 'philosophy of life'. As such, it attempts to offer a deeper exploration than the London one, arguing that the French have a particular attitude to life that makes them very different to Americans (the show's main audience). Yet to be honest, I struggled to make much sense of many of the reflections offered - there is, apparently, a French type of individualism, but it isn't entirely clear what this is, a French attitude to children (tell them to be wise, rather than good), which was also not at all easy to fathom, and so on. The presenter, noted journalist David Schoenbrun, clearly wants to paint a philosophical portrait of this most philosophical of cities, but in the end, the many generalizations he offers are too vague and sweeping to be convincing. To my mind, the most interesting scene is Schoenbrun's interview with his own daughter, who gives a very down-to-earth account of what living in Paris is like, especially for an American, which is, frankly, more insightful than many of her father's observations. In many ways, I would have preferred a more straightforward travelogue (visiting the Eiffel Tower, Notre Dame, the Louvre etc. ), though there certainly are engaging moments. Plot synopsis: A pair of astronauts arrives on Venus only to discover that it is populated by a host of bizarre life forms, including sentient vegetables. The radio play was later turned into a short story, 'A Pride of Carrots', first published in The Magazine of Fantasy and Science Fiction, in December 1959.
Review: Very, very silly - but also hilarious. Boasting one of the most ludicrous titles of any OTR episode, this is a joy to listen to from start to finish. The episode makes no attempt to hide the fact that its story is an allegory of the Cold War - with Venus divided into two factions of talking vegetables, carrots representing the West, and onions and leeks the East (yes, really!) - but even in our post-Cold War world, it still works well as a pointed commentary on ideological conflict and balance-of-power politics. The story belongs within the tradition of fantastical literature that includes writers like Swift - as with Swift's Gulliver's Travels, the fantasy serves a satirical purpose, and it does not matter that its specific targets have been consigned to the dustbin of history. Yet regardless of the points it is making, the episode is also simply very funny: it is impossible not to be amused by the sheer absurdity of the plot's twists and turns, which become increasingly ridiculous. At the same time, the story manages to convey a degree of poignancy at the end as - SPOILER ALERT! - one of the main characters experiences a genuine sense of loss and sadness ... over the death of a vegetable! As a bonus, the episode is narrated by its author, Robert Nathan, who also wrote the short story that the CBS Radio Workshop adapted as Report on the Weans - another excellent episode. It's interesting that Nathan is generally no longer well-remembered in the fields of fantasy and science fiction, even though he wrote a number of stories and novels with fantastical elements. Still, be sure to remember the episode's most important message: be kind to carrots! Plot synopsis: A man's obsession with do-it-yourself leads to disastrous consequences. Review: A searing indictment of ... DIY! Sometimes, it's hard fully to understand the social concerns of earlier eras - as is the case with this episode, which presents the growing popularity of DIY in the 1950s as some sort of terrible plague sweeping across modern America, leaving chaos and destruction in its wake. Was it really seen as such a problem at the time? It's hard to believe, but perhaps there really was an epidemic of broken limbs and other injuries caused by people taking on simple domestic repairs and improvements themselves. Regardless, and despite the fact that the psychological analysis is sometimes pretty daft - at one point, the story even suggests that DIYers are motivated by an 'oedipal drive' - this is actually quite a fun episode. In particular, it gets good comedy mileage out of the various DIY manias and calamities of its main characters. Furthermore, the episode does provide some valuable insights into the phenomenon it depicts, including showing how the DIY 'movement' arose as part of the aspirational nature of post-war society, with its consumerist desire for newly built modern houses with all mod cons. Similarly, the argument it puts forwards that DIY is a reaction against the specialization of modern economies - in which workers rarely get to create whole products anymore, instead working only on small parts of the production process - is a very interesting one.